There are some classics which, upon reading, you can easily see the reason for their acclaim, and their ability to persist and live on through the literary ages. And then there are others which are somewhat more mystifying. To me, The Adventures of Tom Sawyer belongs to the latter. "Adventures of" is a fitting choice of words, as the book is less concerned with a single unifying plot than it is with detailling the various episodes in the childhood of a Southern boy. There is a small attempt at a larger story with the "Injun Joe" plot that pops up now and again, but most of the book is still concerned with the mischievous pranks and antics of a boy who is not bad but simply very naughty. In fact, part of my dissatisfaction with the novel comes from this "bad boy" approach. I can understand that many might find Tom Sawyer's mischief quite amusing in an "oh aren't little kids precious" sort of way; since I don't find such behavior nearly as cute as most, the overly-pleased tenor of the narrative voice was largely lost on me. Then again, Twain states in the preface that the book was mainly intended for boys and girls, and perhaps as an entertaining yet lightweight piece of children's fiction it's more successful. In the course of my research, I've come to understand that the sequel novel, The Adventures of Huckleberry Finn, is generally agreed to be vastly superior and universally acclaimed, but that Tom Sawyer is the more read work of the two. I'm kind of at a loss as to why this might be; why wouldn't the universally preferred novel be the one that's most widely read? I expect I'll move on to Huck Finn someday, and see if I can understand the appeal a bit more. As this was my first read of anything from Mark Twain, I was enormously underwhelmed. 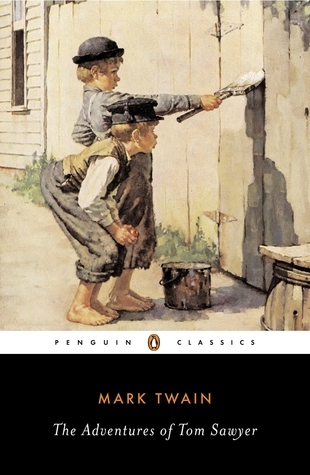 Sign into Goodreads to see if any of your friends have read The Adventures of Tom Sawyer. The Conneticut Yankee in the King Arthur's Court may be more enjoyable, it's certainly more creative. Relstuart wrote: "The Conneticut Yankee in the King Arthur's Court may be more enjoyable, it's certainly more creative." That's good to know; I'll keep that in mind. Thanks! Huck Finn is actually very excellent. There's real depth and pathos and the character learns and grows. Just skip the end when Tom Sawyer shows up to screw everyone over again.